A one step Polish and Sealant that removes swirls or scratches whilst adding durable protection to your paintwork. 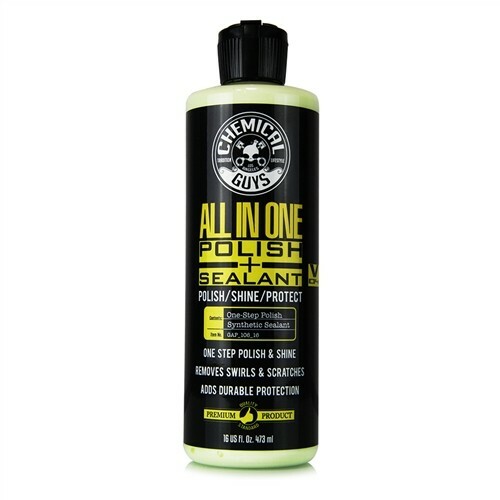 Chemical Guys V4 All In One Polish creates a mirror finish topped with durable protection in just one step. V4 cuts away light imperfections, scratches, and swirls, finishes like a fine polish, restores lustrous shine and deep reflection, then adds a layer of durable protection against the elements. Use V4 on single stage and clear coat finishes to remove scratches and restore deep lustrous shine. Chemical Guys V4 is formulated for fast work time on any dual-action or rotary polishing machine. V4 is water-based, body shop safe, and OEM approved to deliver fast results. For a fast one-step swirl remover that gives durable protection, use Chemical Guys V4 All In One Polish. Work on cool surface. Shake Well. Always work 2’ x 2’ section at a time. Using a polishing pad, work the V4 All-In-One Polish into the paintwork to remove swirls, scratches, and oxidation. Remove excess residue using a premium microfiber towel to achieve a brilliant shine. Follow by applying a coat of your favourite Chemical Guys wax or sealant. Apply 4-5 drops to desired pad. Prime pad with Chemical Guys Pad Conditioner. Spread on speed setting 1. Set DA machine to speed setting 5-6. Always work 2’ x 2’ section at a time. Using moderate pressure, work area in 2-3 passes until polish becomes clear. Follow with light pressure to finish. Remove residue with a clean microfibre towel. Follow by applying a coat of your favourite Chemical Guys wax or sealant. For even more durable and long term protection, follow by applying a coat of your favourite Chemical Guys wax or sealant. Apply 4-5 drops to desired pad. Prime pad with Chemical Guys Pad Conditioner. Set machine 1000-1500 RPMs to spread product. Always work 2’ x 2’ section at a time. Using just the weight of the machine (no pressure) work area in 3-4 passes until polish becomes clear. For final pass adjust speed setting to between 1200-1800 RPMs. Work until optical clarity has been achieved. Remove residue with a clean microfibre towel. Follow by applying a coat of your favourite Chemical Guys wax or sealant. For even more durable and long term protection, follow by applying a coat of your favourite Chemical Guys wax or sealant.